Windows 10 comes with the new web browser, Edge, that is also set up as the default application for handling several other popular files, such as PDF. If you prefer another program to open the PDF files, you can set up that program using the Default Programs tool of Control Panel. You could also use the Open With... command that appears on the right-click menu for the PDF files. However, in some situations, changing the default application for handling the PDF files does not stick: it may work once or twice, and then Microsoft Edge takes over, reverting the file association of the PDF files to itself. You can try to change the default application once more, but soon Windows "forgets" about your decision and starts opening them with Edge again. If you experience such a problem, the following solution might help. 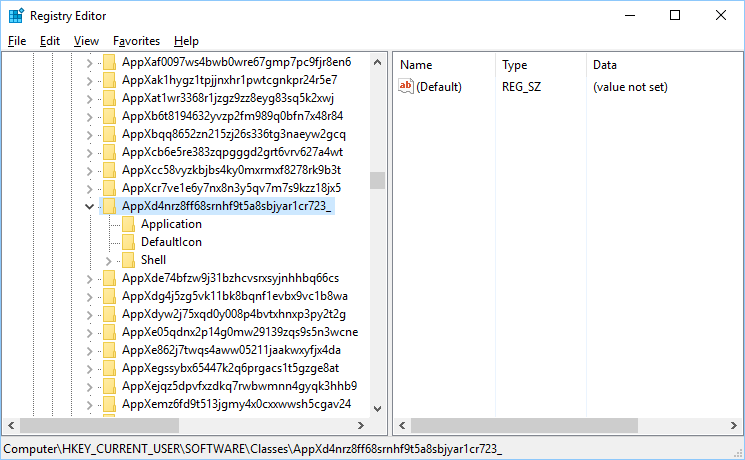 First things first: the following steps involve changing values in Windows Registry. Please be extra careful with it, because if you do something wrong, you can damage your Windows installation and even make your computer disabled. If you are not familiar with the Registry Editor, you may want to ask a more experienced friend or a colleague for help. Take a note of the Data string displayed for the .pdf name. At the time of this writing, the string is AppXd4nrz8ff68srnhf9t5a8sbjyar1cr723, but it may change in the future versions of Windows. Now use the Default Applications tool of Windows Control Panel one last time to set up a default application for the PDF files (other than Edge). 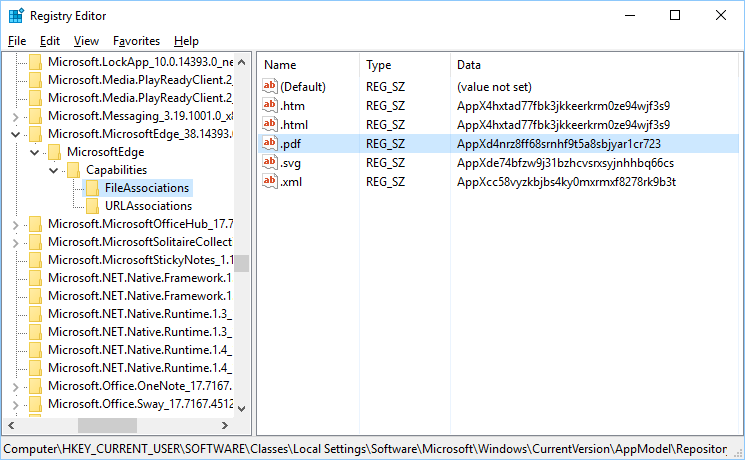 From now on, Edge should not reinstall itself as the default application. If you decide later on that you want to return to the previous behavior, simply remove the underscore character from the name of the AppXd4nrz8ff68srnhf9t5a8sbjyar1cr723 key (thus restoring its original name).